Michael Friel has taught still life painting for more than 10 years at the Gage Academy of Art in Seattle, Washington, one of the leading professional art schools in the country. The equivalent of a foundation course in traditional oil painting for beginning to intermediate level artists, tihs in-depth book uses the still life as a practical way to master oil techniques. The still life is a practical, forgiving genre as it does not require the likeness of a portrait or the accurate proportions of the figure and, unlike the landscape, it doesn't change with the weather. Instead, it gives aspiring artists ample time to study and the opportunity to look closer. It can be used as a purely formal subject for drawing and painting techniques, or a platform for emotional expression using personal symbolism and imagery. 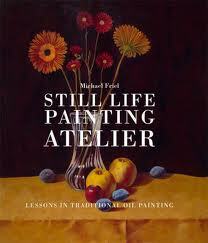 However, though the still life is used throughout as a teaching tool, this is first and foremost a book about oil painting. It begins with simple compositions that build to more complex arrangements. Starting with essential information on how to best set up your studio - including lighting, equipment, material (paints, solvents, brushes, mediums), and preparing your canvas and paper for oil painting - Still Life Painting Atelier then offers concrete lessons in a logical progressive sequence, with step-by-step illustrations, finished paintings, diagrams, and tips.